Mercedes-Benz has been fairly transparent about the development of its first pure electric vehicle, the EQ C. Now the German luxury brand has revealed out first official look at the real deal with the above teaser shot. The EQ C has been under development for about three years, previewed by the Generation EQ concept vehicle Mercedes showed off on the auto show circuit over a year ago. Once launched, the EQ C will be an SUV, similar in size to the GLC Class. Despite the brand’s openness about the EQ C’s development, Mercedes has been mum on details of the production version. Aside from the fact it will be the brand’s first totally-electric EQ model, little is known when it comes to details. 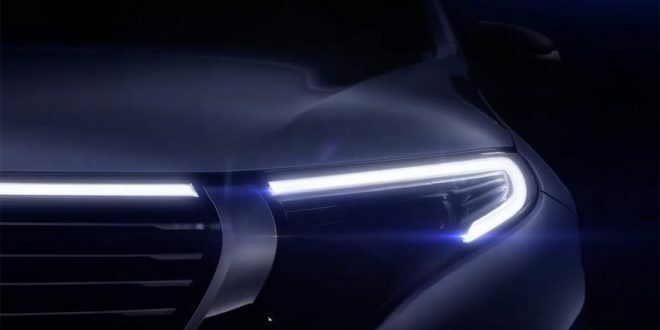 What we can devise from the teaser shot is that the EQ C will have a very dramatic LED light treatment with an overall graphic similar to the EQ concepts Mercedes has displayed. What is still open for debate is rather or not the EQ C will have a traditional grille or not. Based on the image, it appears there is a normal grille design, but every EQ concept has not had such. Mercedes is slated to reveal the EQ C on September 4th in Stockholm, Sweden.